Until July 7, Minerva Theatre, Chichester, www.cft.org.uk. Tickets from £20. Widely regarded as one of the rudest plays ever written, William Wycherley’s The Country Wife has thrilled audiences for over 300 years. It’s set in the City of London in the 17th century. Harry Horner wants to seduce as many women as possible, but he needs to convince their husbands that he’s physically incapable of it. Surprisingly, his pretend impotence allows him to find those ‘virtuous’ ladies who secretly want him. But Harry hasn’t reckoned with Mr Pinchwife’s young spouse Margery. The show stars Jonathan Munby and Susannah Fielding. Friday, June 15, 8pm, £25.50, The Capitol Theatre, Horsham, 01403 750220, www.thecapitolhorsham.com. This spectacular Eagles tribute heads to Horsham with its acute attention to detail and incredible showmanship. The musicians have been touring for over two decades and remain true Eagles fanatics. Their extraordinary mastery of the Eagles’ distinctive sound has lead to their longevity and continued international acclaim. The concert features the best from the Eagles’ repertoire including ‘Hotel California’, ‘Take it to the Limit’ and ‘Life in the Fast Lane’. Find out more at illegaleagles.com. 3. Lipstick on Your Collar. 4. Fastlove – A Tribute to George Michael. 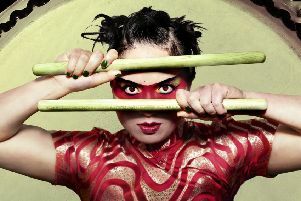 Saturday, June 16, 8pm, £24.50, The Capitol Theatre, Horsham, 01403 750220, www.thecapitolhorsham.com. Horsham pop lovers can relive the passion, flair and unique sensitivity of George Michael at The Capitol this weekend. Fastlove, the incredible concert sensation, is packed with crowd-pleasing anthems, from the Wham! classics of the new pop revival to the chart-topping success of the 1980s album Faith, plus some awesome tunes from the ’90s and 2000s. Hits include ‘Careless Whisper’, ‘Freedom’, ‘Faith’, ‘Father Figure’, ‘Outside’, ‘Jesus To A Child’ and many more. 5. Chris Wood: The Close Up Show. Tuesday, June 19, £41-£46.50, 7.30pm, Assembly Hall, Worthing, 01903 206206. Marti Pellow is one of Britain’s iconic music stars. Having achieved the highest accolades with one of the most successful bands in UK pop history (Wet Wet Wet), he now has a successful career as both a solo artist and as a leading musical theatre star. He has performed from Broadway to Tokyo, in sold-out theatre tours and in many starring roles in the West End. 8. A Contour, A Curve – The Lie Of The Land. A new exhibition at Gallery57, 57 Tarrant Street, Arundel, until August 27. Ann Symes, artist and owner, said: “Jayne Walker’s (bottom circular picture) land vessels express the theme and title of Gallery57’s summer exhibition perfectly. The geographical features of the Welsh and Cornish landscapes, visited and endlessly explored since childhood, inspire her sculptures. She carves Crystacal, a durable plaster, into forms that describe the curves of the land and coast while the patterns and textures of geological strata, water, sand and rocks provide inspiration for the pencil drawings she sometimes uses to emphasise an area within them.” The exhibition also features works by Emily Moore, Rosemary Vanns, Keith Varney, David Scott Moore, Carys Davies and Sylvia Quinnell. Find out more at www.gallery57.co.uk. 9. A Spagna In The Works. Wednesday, June 20, 7.30pm, St John’s Chapel, Chichester. Ethereal, enigmatic and exhilarating – renaissance miniature masterpieces. A rare chance to hear 16th century dances, divisions and instrumental settings played on a variety of early viols and lute by distinguished artists Alison Crum and Roy Marks, both core members of the Rose Consort of Viols. June 21, £25, 7.30pm, The Hawth Theatre, Crawley, 01293 553636. This band are renowned for their celebration of the music of one of the world’s greatest bands. Think Floyd pride themselves on faithfully recreating Pink Floyd’s music, backed by a dedicated team of sound and lighting engineers and an impressive laser light show. The production captures all the atmosphere, magnitude and musical excellence of Pink Floyd live on stage.